Keep Electronic Discharge Weapons (EDW) secured and ready for action with the ALS EDW Holster with Clip from Safarland. Featuring a powerful automatic locking system, the holster provides enhanced weapon retention for greater security in the field. The lock grabs hold of the EDW's body, guaranteeing level I retention security, and automatically engages the safety for additional safety. Its rugged polymer body is uniquely designed to protect the weapon's top half including the LED display, from abrasions and other forms of damage. 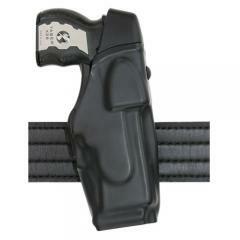 The holster includes a clip-on style belt loop that attaches to duty belts from 1.5 to 2.25 inches wide. Safariland products are always superb. Wouldn't hesitate to recommend or purchase again. Would also recommend CopsPlus. Great prices and customer service.